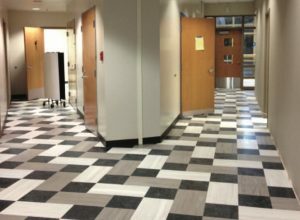 Luxury vinyl tile (LVT) is bursting onto the scene of nearly all commercial sectors — and with good reason. Now sporting a greater variety of styles, patterns and sizes, the product is reported to be the fastest growing commercial flooring category today. Last year sales were estimated to have increased 8% to 10%, and there is a similar spike projected for 2016. Obviously expanded aesthetics is not all LVT has to offer. 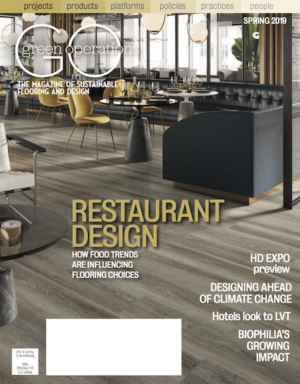 With this idea in mind, Green Operations sat down with some mills and members of the A&D community to learn exactly what innovations are driving LVT’s substantial growth across all segments. 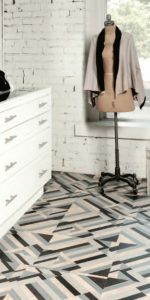 LVT collection for high- traffic areas, pointing to better wear layers and overall product durability. Advancements in UV-cured urethane have improved LVT maintenance requirements while thicker wear layers are enhancing overall performance. For example, several Tarkett LVT products offer UV-cured urethane finishes with 20 mil or greater wear layers. “LVT is going into spaces where moisture and other conditions make it difficult to install laminate but a wood look is desired,” said Jeremy Salomon, senior product manger, Tarkett. Fanning Howey recently specified Armstrong’s Striations collection, touting its ease of installation and sustainable qualities. Members of varying commercial sectors are looking to LVT to achieve a more “healthy” built environment. “LVT actually con- tributes to people’s well being,” Salomon noted. For example, recent innovations have enabled LVT to satisfy one of the most important demands of a healthcare facility: clean material composition and a sustainable environmental impact. To that end, PVC-free LVT products have become a popular choice and even a standardized spec as they reduce toxic exposure during facility fires and do not add to PVC waste landfills. LVT also complies with indoor air quality guidelines and FloorScore; it continues to improve, helping the design community specify quality products with lower environmental impacts for commercial areas. And further advances in loose lay and click floating floor options allow for adhesive-free installation, preventing down time for drying and eliminating odors and VOCs.